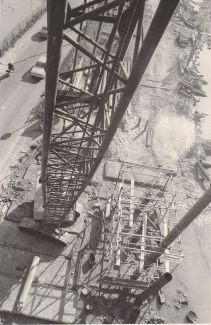 The general view of the construction site. 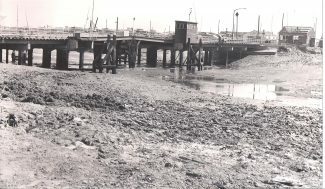 By the 1960’s the volume of traffic crossing the bridge to and from Canvey was such that severe jams were being caused due to the continual opening of the swing section to allow boats to pass through. 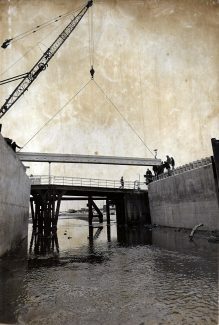 Therefore a new bridge was commissioned. 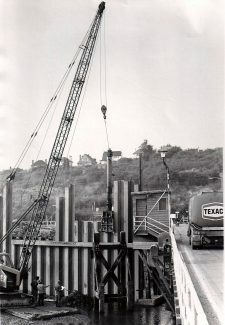 Shipping was stopped from coming up into the Benfleet basin and work to construct the new crossing was started in late 1970. 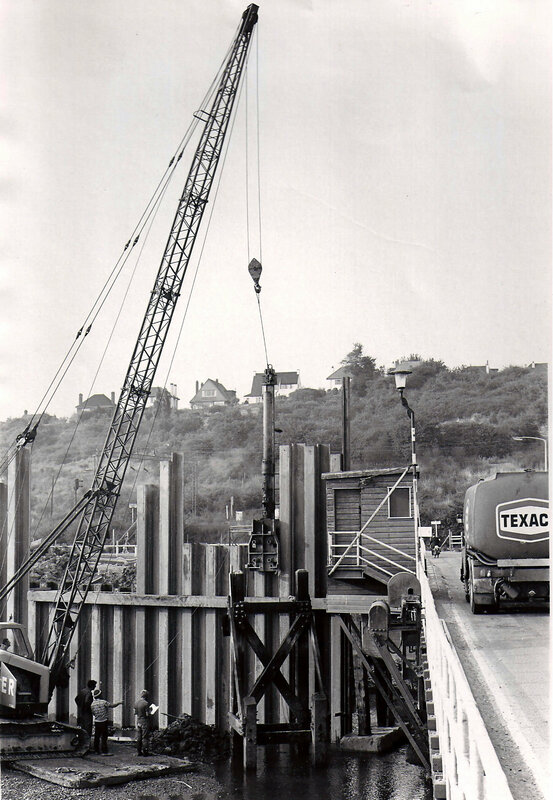 Some of the following photographs were given to us by Rosemary Smith, and supplied by Alan Loxley, the site engineer of Kiers, the company retained to construct the new bridge. 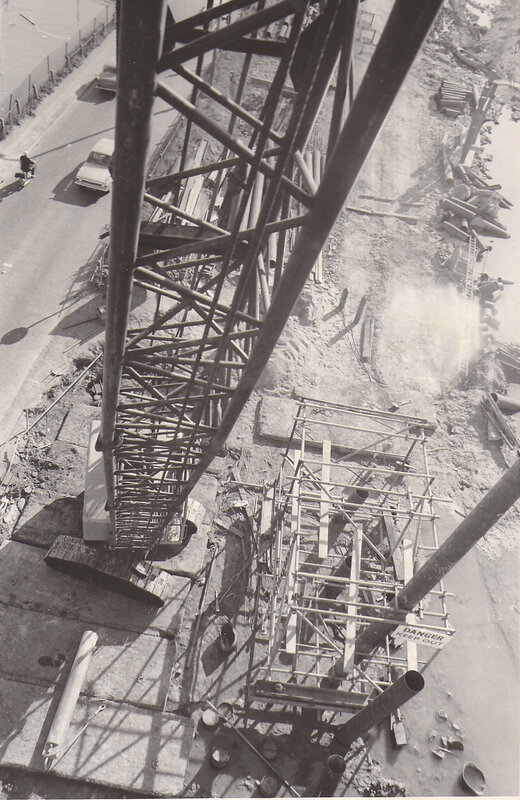 The photos show the various phases of the development from the initial piling to building the road. 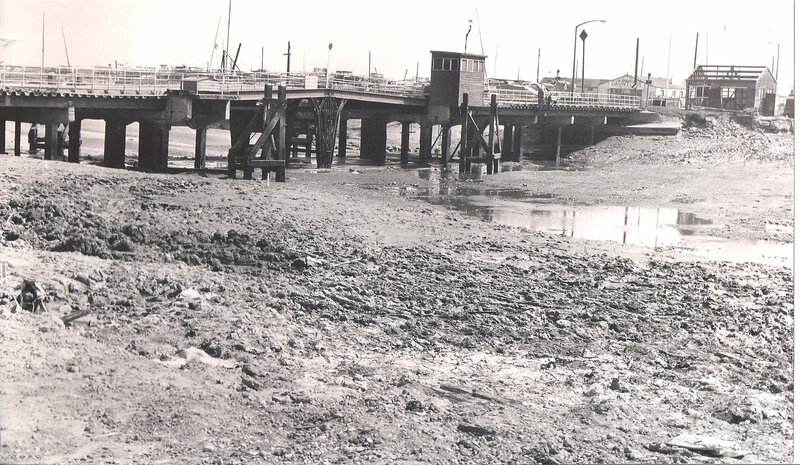 The first photo shows the Benfleet approach road to the bridge. 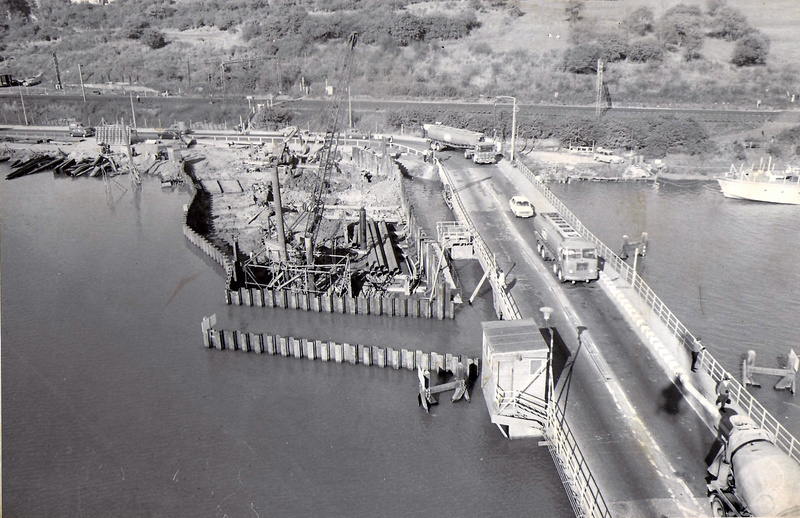 This of course is now where the buses stop when they come off the island. 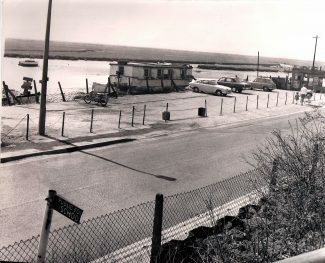 Note the old sign in the foreground indicating the public footpath, which would have crossed the railway line, and either points to School Lane or even the old school itself. This would be the old school in School Lane which disappeared many years earlier. 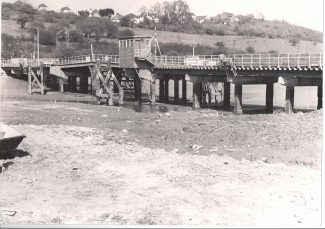 Photographs 2 and 3 show the old bridge looking towards Benfleet and then to Canvey and clearly show the swing sections and the bridge operators hut. 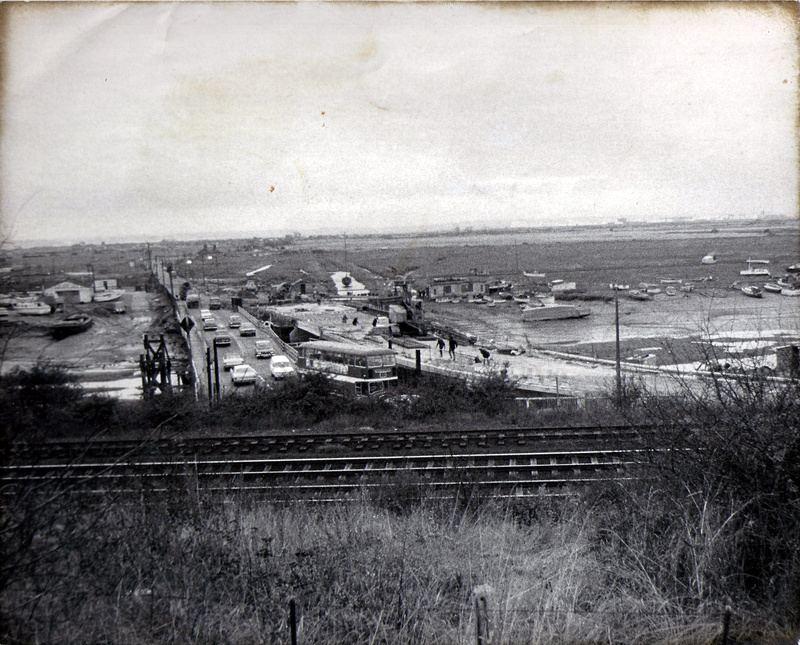 On the picture looking to Canvey you can see the site of the Dauntless boatyard which is still there today. 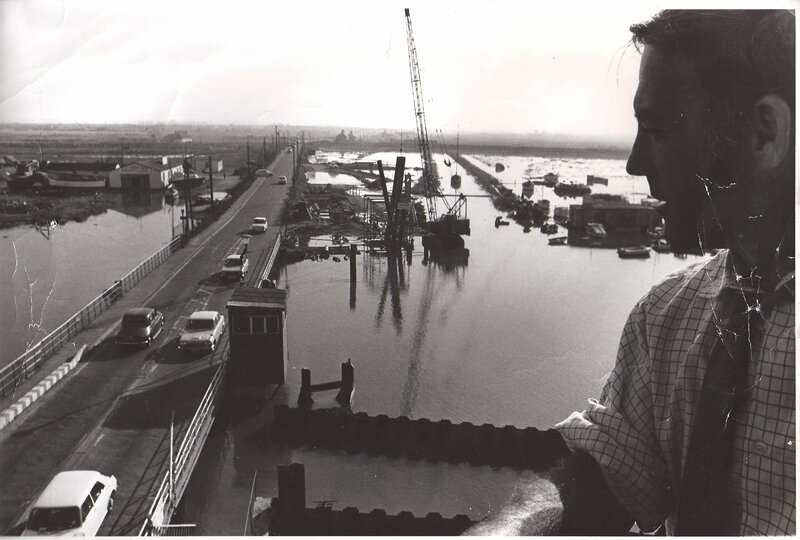 The 4th picture shows, who we presume to be Alan Loxley the site engineer, taking an overview of the initial work taking place in the creek. The first major job to be undertaken is the need for piling and in the next photo some brave soul with a head for heights has taken a picture of piling work from above. 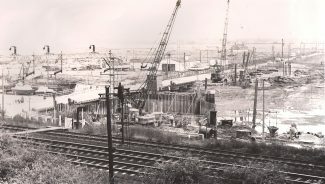 We then see a general view of the construction site taken from the Benfleet side. 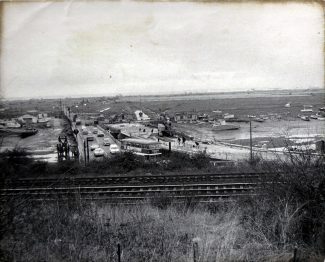 In the bottom left of the picture there is a small white picket gate which we must assume to be the entrance to the footpath across the railway line referred to in the first photograph. 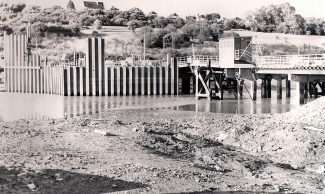 Once the initial piling was completed work progressed to installing the metal retaining walls on both sides of the creek. 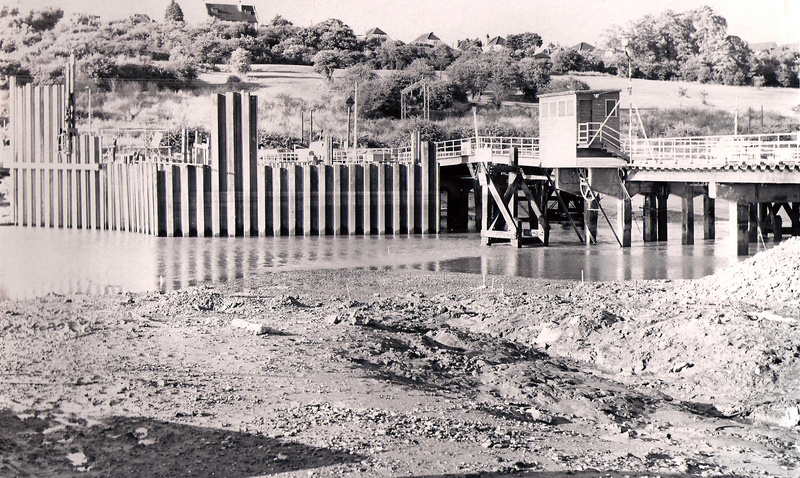 These metal sheets were also put into place with a piling machine which can be seen on the far left of the picture. 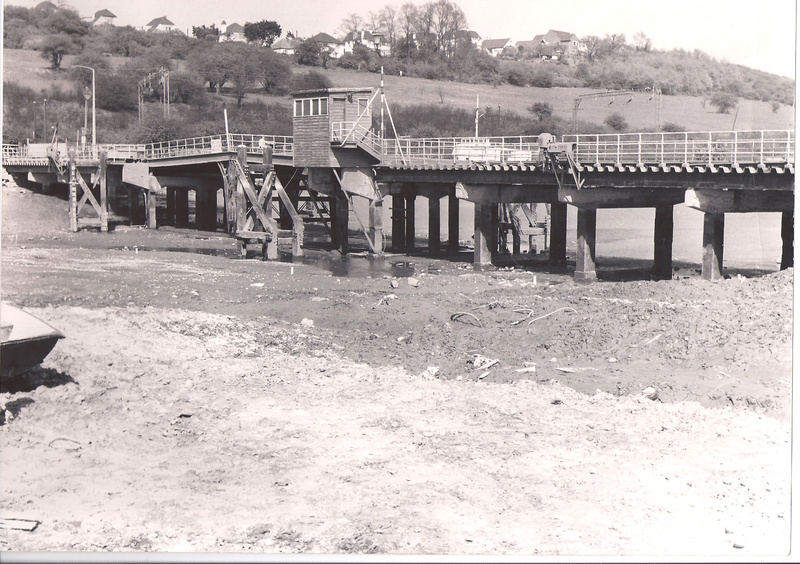 A clearer photograph shows a close up of sheet piling on the South side of the creek. 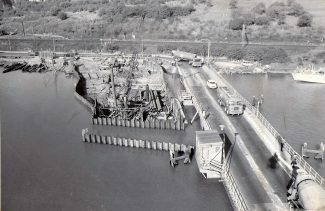 The next photo is an aerial view of the construction site with both sides of the creek now having their barriers protecting the work in place. 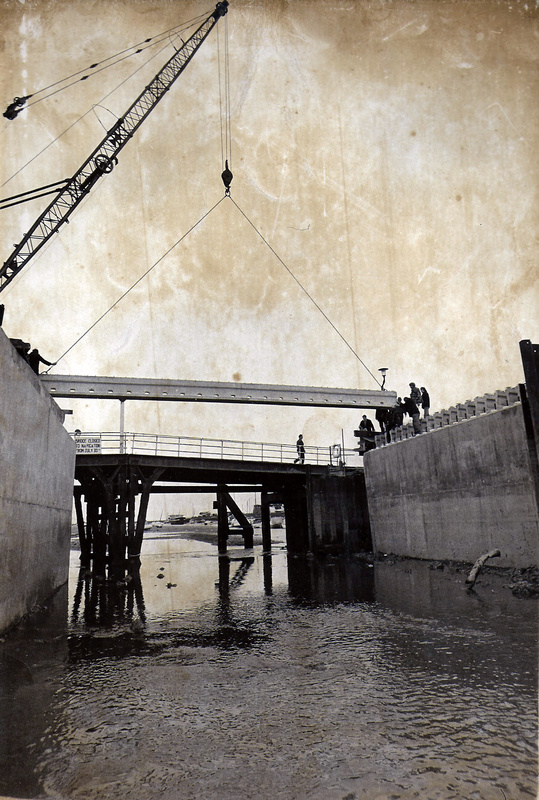 We can see the bridge really starting to take shape. 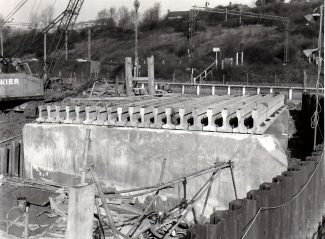 Now the side walls are in place, concrete sections are bolted to either side and cross beams to support the road have to be fitted. 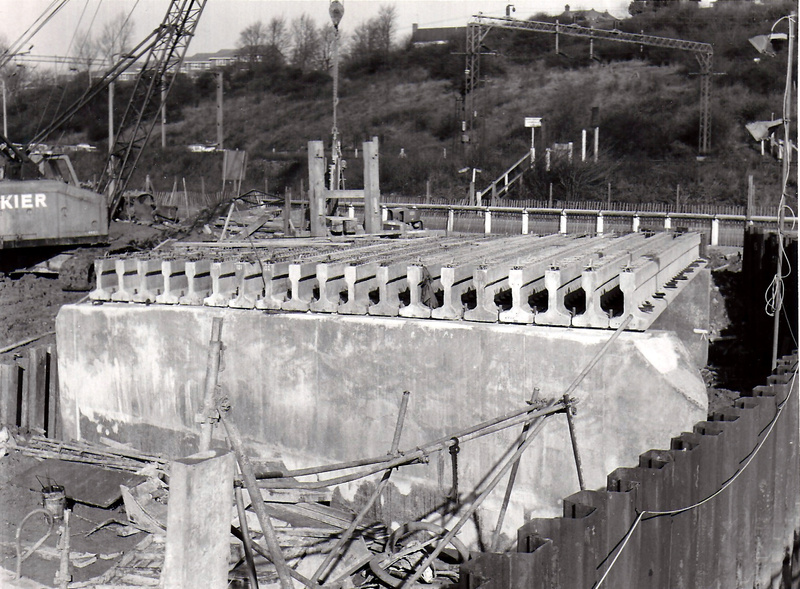 In these next photos we can see the concrete sections have been attached and they are starting to place the crossbeams.We then see all the cross beams in place ready to start on the new road. 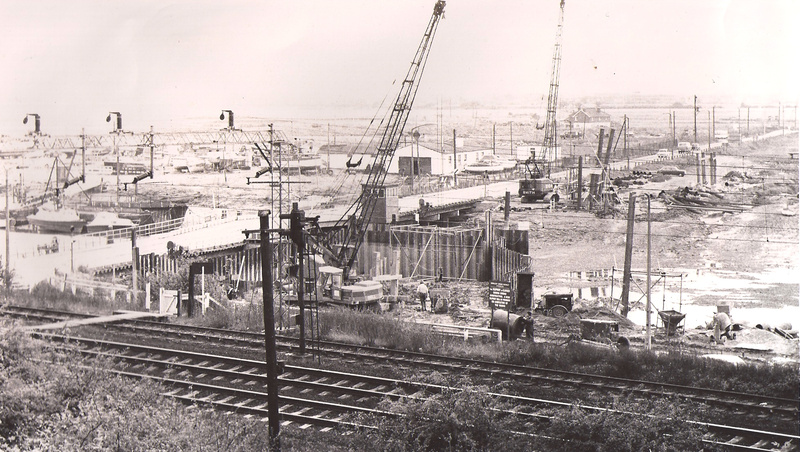 Finally we have an overview of the site where the new road is starting to take shape.